Aaron Wise can check off another milestone from his first season on the PGA Tour. The 22-year-old Wise was named the 2018 PGA Tour Rookie of the Year on Tuesday after finishing the 2017-18 campaign with four top-10 finishes in 29 starts and his first career victory at the AT&T Byron Nelson. The Callaway player was one of three rookies to garner a win on Tour last season. Wise became the second player ever to win on the PGA Tour Canada, Web.com Tour and PGA Tour, alongside Mackenzie Hughes. He also had one runner-up finish this past season at the Wells Fargo Championship. Wise was one of eight rookies to qualify for the 2018 FedExCup Playoffs, but he was the lone rookie to advance to the Tour Championship. During the Playoffs, Wise tied for fifth at the Northern Trust and had two top-20 finishes. Wise finished the season 24th in the FedExCup Standings. Aaron Wise, who won PGA Tour Rookie of the Year, watches his ball after teeing off. 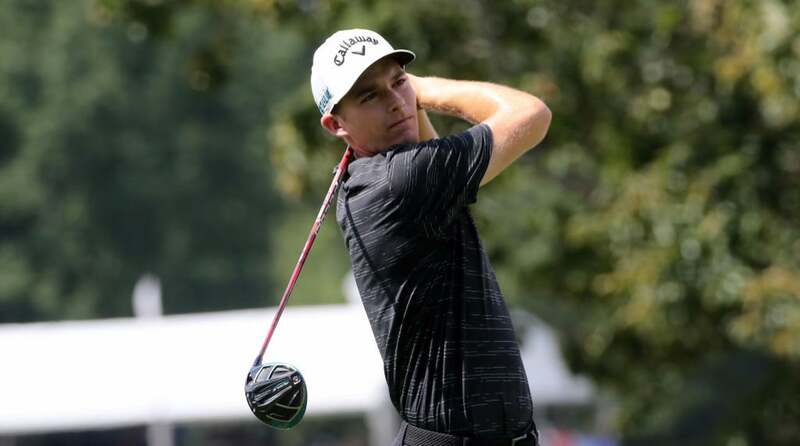 "On behalf of the PGA Tour, our congratulations to Aaron Wise on being voted PGA Tour Rookie of the Year,” said PGA Tour Commissioner Jay Monahan in a release. “For Aaron to have won on the PGA Tour, the Web.com Tour and Mackenzie Tour before the age of 22 is remarkable, and qualifying for the Tour Championship as a rookie proved there is no stage too big for him.” Perhaps the coolest part of the honor is that Wise can now put himself in the same breath as Tiger Woods. Wise, who hails from Las Vegas and played collegiately at Oregon, is the first player from a Pac-12 school to win the Rookie of the Year award since Woods earned the honor in 1996 following his collegiate career for Stanford. The award was voted on by PGA Tour members who played in at least 15 FedEx Cup events during the 2017-18 season. Wise will make his 2018-19 debut at the Shriners Hospital for Children Open at TPC Summerlin this week. His 25/1 odds to win are the eighth-highest.